Perched on a plateau overlooking a sheer cliff, Ronda epitomizes the drama of Andalusia. The setting is truly spectacular, and the culture is just as exciting - Ronda is famed for its bullfighting and bandits. Ernest Hemingway set some scenes of his novel For Whom the Bell Tolls in Ronda, immortalizing the special aura of this place. The most amazing site is the Puente Nuevo bridge, which straddles the El Tajo gorge, a breathtaking ravine 130 meters deep. Another top attraction is the Plaza de Toros, Spain's second oldest bullring, which is still used to stage bullfights. Tourists will also be enchanted by the quaint old streets and whitewashed buildings of La Ciudad, the old Moorish town. To further explore Ronda's exotic heritage, visit the Museum of Bandits and the ancient Arab Baths along the Arroyo de las Culebras (Snakes' Stream). The Puente Nuevo is the most emblematic monument of Ronda. Built in 1788, the bridge is a feat of engineering and a masterpiece of stone masonry. The 70-meter-long bridge crosses the El Tajo Gorge at its narrowest point and reaches a height of 98 meters from the bottom of the ravine. The bridge connects La Cuidad, the historic old Moorish town of Ronda, with El Mercadillo (Market Quarter), the modern part of town. From the bridge, the views of the gorge and the Río Guadalevín are stunning. Tourists can also get a great view of the Puente Nuevo by walking along the trails of El Tajo. The main path takes a zigzag course (a 30-minute walk) to the lower mills. A side path on the right (a 20-minute walk) travels through a small Moorish gate, the Arco Arabe, to the upper mills. From either path, hikers are rewarded with gorgeous views of the waterfalls and the Puente Nuevo. The second oldest bullfighting ring in Spain, the Plaza de Toros is a living testament to the region's most famous custom. Ronda was the home of the Romero dynasty of matadors (Francisco, Juan, and Pedro), who developed the rules of the present-day bullfight in the 18th and 19th centuries. This site is the main tourist attraction in El Mercadillo, the new town of Ronda, and was immortalized by Hemingway in his novel Death in the Afternoon. The Mercadillo quarter is separated from La Cuidad (the old Moorish town) by the El Tajo ravine. Built in 1785, the Plaza de Toros is a monumental bullring with a 66-square-meter arena and two tiers of arcaded galleries for seating spectators. The covered galleries feature elegant arches of Tuscany columns as well as Royal Box Seats. Tourists can watch the famous Goyesca Bullfighting in September during the Pedro Romana Fair. Otherwise tourists may visit Plaza de Toros and its Museo Taurino (Bullfighting Museum), which are open year round. A hidden treasure of Ronda, these 13th- to 15th-century thermal baths are considered the best-preserved Moorish Baths in Spain. The Baños Arabes are near the Puente Viejo in the Barrio de San Miguel just outside of La Cuidad. The baths were built along the Arroyo de las Culebras (Snakes' Stream), a source of spring water, which has a perfectly preserved water wheel from the Moorish era. Similar to ancient Roman baths, the complex has cold, warm, and hot baths (the heating system was entirely hydraulic). However, the architecture exemplifies Moorish design with a central hall and two other sections separated by the characteristic Islamic-style horseshoe-shaped arches. The barrel-vaulted ceiling features beautiful star-shaped skylights. The baths are no longer in use, but the site is open to the public for visits. The old Moorish town is the soul of Ronda with its historic squares, narrow pedestrian streets and charming whitewashed houses. La Cuidad has an Old World European charm combined with some of the ambience of a medina (walled medieval town of North Africa). This is the area where tourists will find most of the town's cultural attractions. On the picturesque Plaza de la Duquesa de Parcent, the Iglesia Santa María la Mayor is a church that was converted from a former Mosque. The church has preserved four of the Moorish domes, however the interior is Gothic with a Plateresque-style Capilla Mayor (chapel) added in Christian times. The sanctuary boasts exquisite Renaissance choir stalls and a Moorish mihrab (prayer niche indicating the direction of Mecca). To the west of Santa María la Mayor Church, at the edge of the plateau, is the Palacio de Mondragón. This Moorish and Renaissance-style palace once provided luxurious accommodations for the Catholic Monarchs. Nearby is Casa Juan Bosco, a 20th-century palace set in beautiful gardens. On the Calle Armiñán, the Museo del Bandolero (Museum of Bandits) illustrates the history of the 19th-century bandits who lived in the mountains around Ronda. Despite its name, the Casa del Rey Moro was never the home of a Moorish King. The mansion was built in the 18th century on the site of a 14th-century Moorish well. The building is not open to the public, but visitors may wander the gorgeous gardens. To find the gardens, take the flight of stairs decorated with ceramics. A breathtaking outdoor space on three tiers, the gardens were designed in 1912 by landscape gardener Jean Claude Forestier of France. The gardens also feature gushing fountains and soothing water lanes similar to the gardens of the Alhambra. Colorful flowers and ponds filled with water lilies add to the beauty. From the terraced garden, visitors can admire sweeping views of Ronda's stunning natural landscape. A flight of 200 steps descends from the gardens through the rock to the Guadalevin River at the bottom of El Tajo gorge. The end of August and first week of September is the most festive time in Ronda, when the Fair of Pedro Romero takes place. The city comes to life with music, dancing, and singing in honor of Ronda's renowned matador Pedro Romero. The event begins with a parade featuring Goyaesque Ladies, women who are flamboyantly attired in authentic regional costumes. The fun continues with folklore shows, concerts, theater performances, and a Flamenco Singing Festival. A highlight of the fair is the Goyesca Bullfighting, which reenacts the traditional bullfighting from the epoch of Goya complete with 18th-century costumes. After visiting the Plaza de Toros, tourists can walk along the Calle Virgen de la Paz to the Alameda de José Antonio. This beautiful 18th-century park has a broad promenade, ideal for relaxing or taking a leisurely stroll. The park also offers sensational views. Areas of the park sit on projecting spurs of Ronda's rocky plateau. From the balconies (protected by railings), visitors will be awestruck by the gorgeous panoramas extending across the El Tajo river gorge and over the plains to the mountains. A beautiful 19th-century public park, the Alameda del Tajo is next to Plaza de Toros overlooking the Tajo gorge. Filled with towering pines, this lush and spacious garden provides a welcome shady spot to relax on warm days. The park's tree-lined paths are ideal for taking walks. Many local families head to this park for the paseo (evening stroll). A duck pond adds to the peaceful environment. Some areas of the park offer magnificent panoramic views of the Ronda landscapes. The Alameda del Tajo is near two noteworthy hotels. The Hotel Victoria is found near the ledge of the plateau on the Promenade des Anglais. The southern part of the park joins the Paseo de Blas Infante, which leads to the terraces of the Parador de Puente Nuevo, a sleek and modern luxury hotel with spectacular views. Ronda's two lower bridges over the gorge are reached by taking Calle del Comandante Linares downhill and through an arched gateway. Here, stand the 16th-century Puente Viejo and the imposing Puente de San Miguel. The San Miguel Bridge is also known as the Roman Bridge, even though it was not built during the ancient Roman era. The area around the lower bridges is popular with hikers and nature lovers. A walking trail through the gorge crosses the Puente de San Miguel. Cyclists can take a biking trail through the rugged landscape that winds up at the Puente Viejo. A tradition in Ronda since 1487, the May Fair is one of the oldest fiestas in Andalusia. The event begins with a lively (and delicious) Tapas Fair. 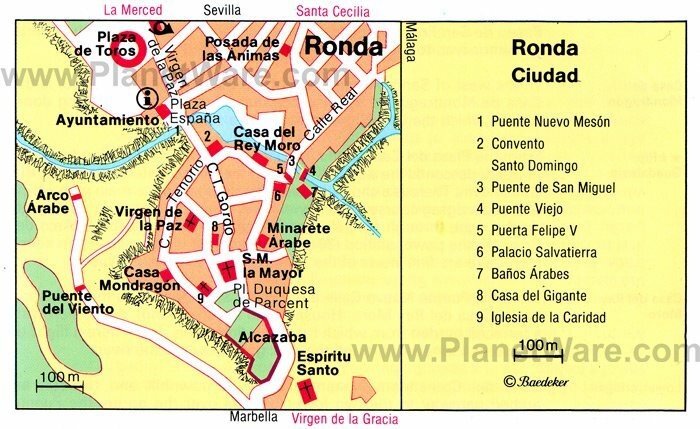 The following days focus on Ronda's rural heritage. Local farmers participate in agricultural demonstrations such as goat milking and exhibitions of livestock. Other highlights of the May Fair include a sampling of regional olive oils, a dog show, and a purebred Spanish horse show and dressage exhibition. Tourists visiting in June will be delighted by this unique event that celebrates the culture of ancient Rome. On the second weekend in June, the Roman Pilgrimage enlivens the entire barrio of Puerto Sauco. For this authentic Roman-style fiesta, the villagers dress up in costumes of that era. A parade and presentation of the Goddess Circe is followed by sporting competitions, games, and theatrical performances.